Bridwell, who lived for decades in a house with a bright red door on Martha's Vineyard off Cape Cod in Massachusetts, died Friday at Martha's Vineyard Hospital, where he had been for about three weeks after a fall at home in Edgartown, his wife, Norma, said. 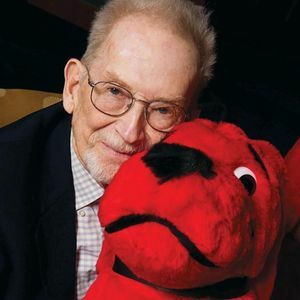 "Years ago my mother taught class and Mr Bridwell visited She wore the Clifford suit all day and as a thank you Mr Bridwell drew a picture for her To this day it is in ..."
"I taught school for 37 years and Clifford was a huge part of my literature teaching. Thank you very much."